I mean, on the most basic level, it is a sign that announces that one can shred CDs here. But the enthusiasm of the text, with its exclamation point, is kind of unsettling to begin with. 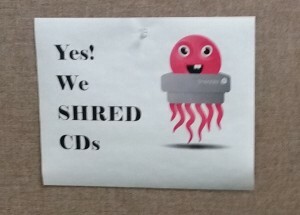 The fact that the CD in the picture is smiling so cheerfully while being shredded is next-level unsettling. But the really unsettling part is that we’re clearly not looking at a happily suicidal anthropomorphic compact disc. No, that is obviously a grinning lil’ Cthulu hiding behind a shredder. Those aren’t shreds of aluminum, my friends – they are obviously tentacles. I think I’m staying clear of that shredder, is what I’m saying. Shredders are probably the worst otherworldy portals there are. 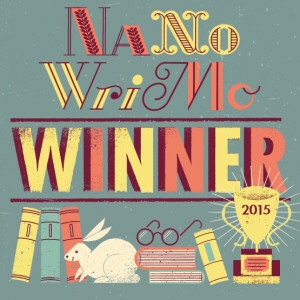 As you can see by the graph below, I have once again won NaNoWriMo. 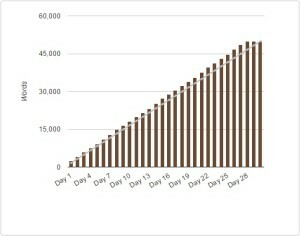 As you can also see, I again managed a wonderfully smooth progression that steadily jumped ahead of the daily wordcount goal one needs to hit 50,000. Finally, you can see from the end there, where it stops dead at 50,008 words on November 28, that I hated the novel by the end of the month and wanted nothing to do with it. Seriously, it’s horrible, some of the worst stuff I’ve written. Still, it’s 50,000 words of something, and hopefully in a few months when I can stand to look at it, I’ll find that maybe 20 or 30k of that is usable as the core of an actual book. That’s what Nano is all about!